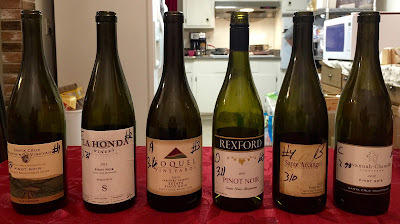 We were joined by our friends to taste the second batch of 6 random Santa Cruz Mountains Pinots under $30 on a brisk Fall night. Unfortunately, some of the usuals were unable to attend: Bob and Carolyn, with Carolyn's knee still healing, and Jose, who was recovering from a couple of weeks in Bolivia. We hope to see them all next time. 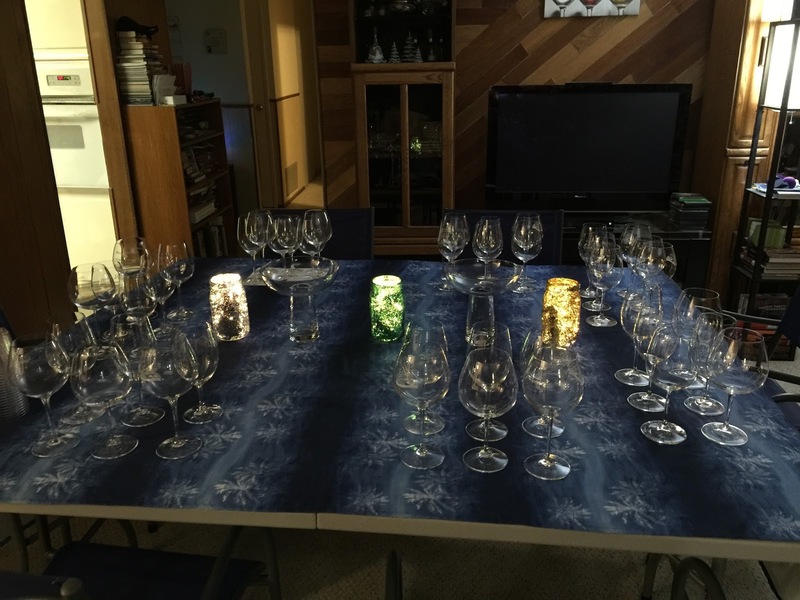 Given the smaller number of participants, we were able to provide a glass for each wines being tasted, a treat for sure. Sue set us up inside, moving the couch back a couple of feet and the rug into another room. Everything looked great! I hoped our friends wouldn't look down and notice any of the spots the rug had covered. Sue decorated a little, setting out some Christmas lights. 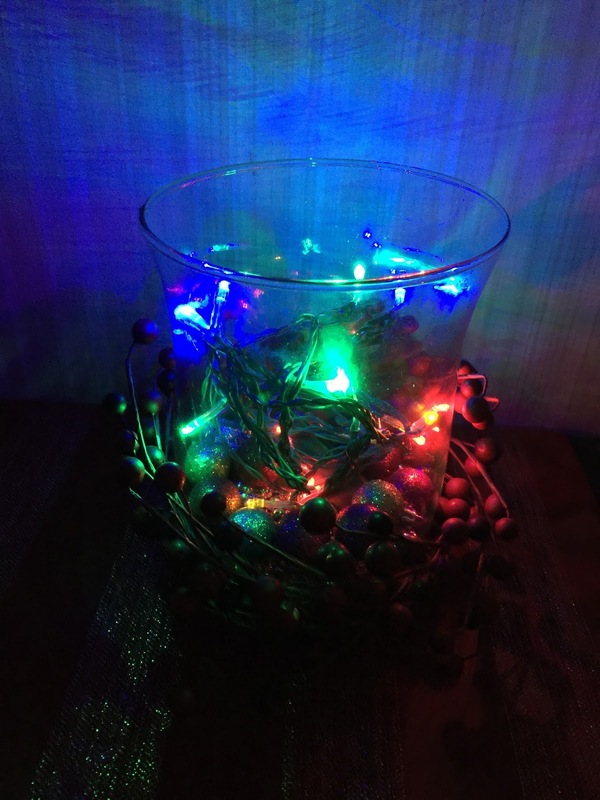 Ted, who normally would have objected to Christmas lights before Thanksgiving, claimed the NyQuil, that was helping him recover from a cold, kept him from complaining. While we waited for everyone to arrive we enjoyed a Picchetti, Brut Rose and a Vine Cliff, Chardonnay. At seven we poured the wines and started rating as we discussed music, video games, politics, and more. I tried to play topical music, but started off with AWOLNATION and Meg Myers, who we had just seen with Ted and Shannon at Live 105's Fright Fest. Paul and Jennifer arrived as we started D, E, and F. We joked that we were just about ready to divvy up their A, B, and C. A glass per wine makes a world of difference in a tasting. It allows all the wines to be revisited, contrasted, and compared. I was sure D was the oldest based on its appearance. Ted disagreed and bet $20 it was F. Ted was right, but I will point out we had chosen the two oldest wines. All the wines tasted really good; all but one averaged above a three (I liked it). 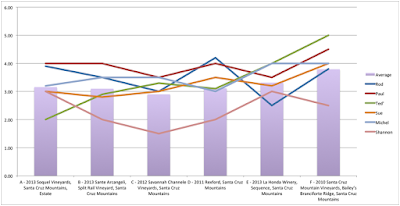 F - 2010 Santa Cruz Mountain Vineyard, Bailey’s Branciforte Ridge, Santa Cruz Mountains came in first place with an average of 3.79. E - 2013 La Honda Winery, Sequence, Santa Cruz Mountains came in second place with an average of 3.31. 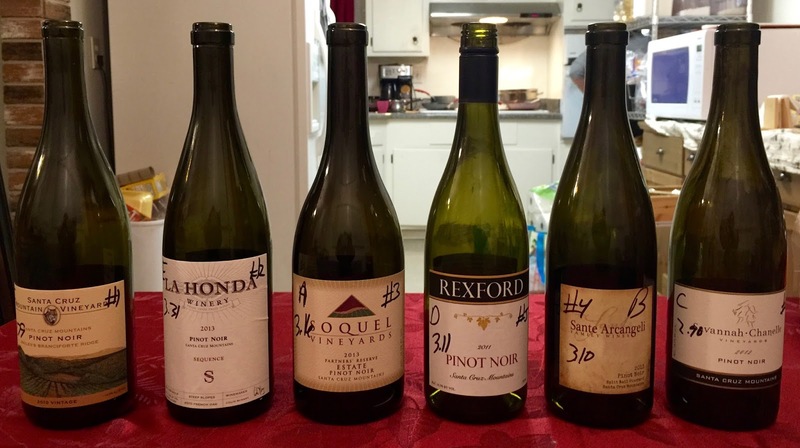 A - 2013 Soquel Vineyards, Santa Cruz Mountains, Estate came in third place with an average of 3.16. D - 2011 Rexford, Santa Cruz Mountains came in forth place with an average of 3.11. B - 2013 Sante Arcangeli, Split Rail Vineyard, Santa Cruz Mountains came in fifth place with an average of 3.10. 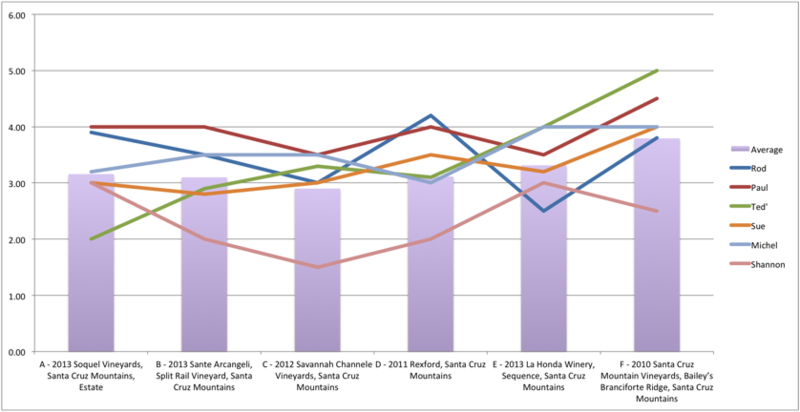 C - 2012 Savannah Chanelle Vineyards, Santa Cruz Mountains came in last place with an average of 2.90. 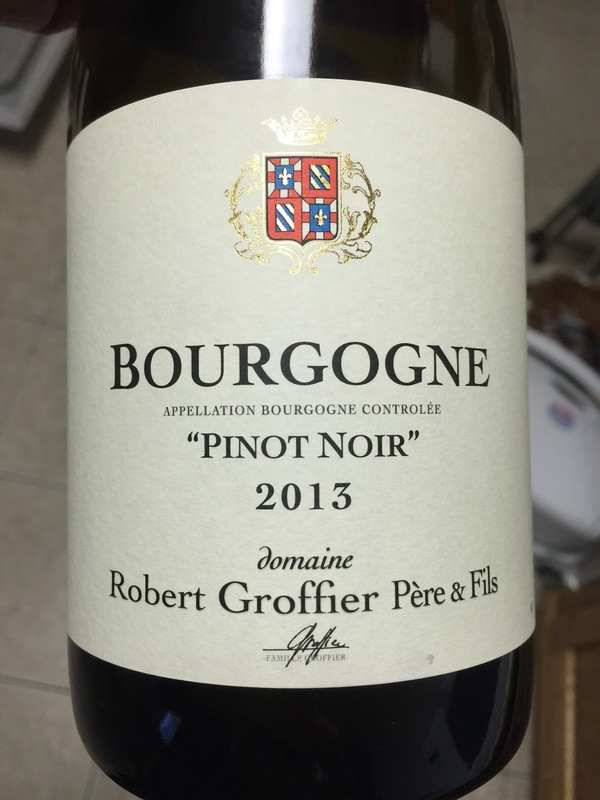 We retried our favorites and a French wine Michel brought: 2013 Bourgogne. Sue served a standing rib roast, fingerling potatoes, and sautéed brussel sprouts for dinner. She ended the evening with warm cookies. A great time was had by all.